A mysterious map discovered in the belly of an ancient ruin has all of Katapesh intrigued. Yet none can decipher the strange markings, nor confirm much about the scroll's purpose. In order to learn more, a trip to the sprawling market city of Katapesh itself must be mounted. Yet others want the map for themselves - scheming merchants, enraged gnolls, and even a murderous society that seeks the treasure as their own. What could be hidden within that could drive so many to such desperate acts of violence and mayhem? Is this artifact truly the one and only Scroll of Kakishon, and does the one who controls it control an entire world? 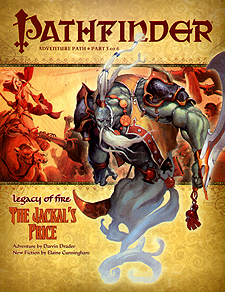 * "The Jackal's Price," an adventure for 7th-level characters, by Darrin Drader. * An exploration of the markets of the city of Katapesh, including a journey into the dangerous Nightstalls, by Richard Pett. * An investigation into the world of genies, from their goals and desires to their secret shames and sins, by Wolfgang Baur. * Pathfinder Channa Ti's adventures lead her into an underground realm filled with betrayal in the Pathfinder's Journal, by New York Times bestselling author Elaine Cunningham. * Five new monsters by Jacob Burgess, Adam Daigle, and Darrin Drader.